Akron, Ohio, January 30, 2019 (Newswire.com) - On Jan. 14, 2019, Regency Furniture, a leading manufacturer of office furniture, filed for a patent on its 9476 Side Chair, a modern-meets-classic piece that has been nearly a year in the making. The Regency 9476 Side Chair brings back a once-beloved Paoli design to the modern era. 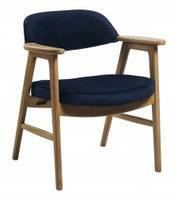 This chair features a mid-century design with a frame constructed of solid wood and a seat made of firm but comfortable upholstery. This chair will soon be available in three different finishes: mocha walnut, natural and cherry, with upholstery choices including navy blue plush fabric and fine Italian leather in black and gray. According to Oakley, the applications for the patent-pending 9476 Side Chair are numerous and include office and board room seating to residential dining and living. Based in Akron, Ohio, Regency Furniture is often recognized for its work with American-made, innovate designs that help solve problems for businesses, schools and families all over the world in the form of casual, elegant designs. For more information on Regency Furniture or to find a retailer for the 9476 Side Chair, please visit regencyof.com. Merritt Synergy System features high resolution joystick.